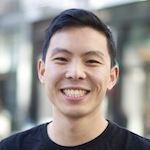 Bryan Peng is a Software Engineer at NovoEd. He graduated with a degree in Computer Science and Electrical Engineering from UC Berkeley. Bryan believes in utilizing technology to transform education and is passionate about the possibilities for online education to reach, interact, and allow collaboration worldwide. 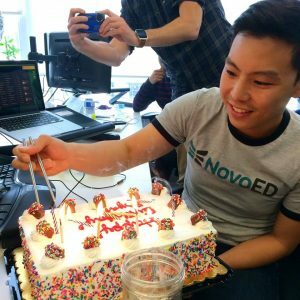 What is your role at NovoEd? I’m a Full-stack Engineer at NovoEd. What’s your favorite snack in the office? It’s Its. The mint ones are my favorite. Our amazing office manager keeps them well stocked. What has been your most memorable feature development at NovoEd? My most memorable moment was working on the team workspace and the team profile which provides a much better experience for our students. What’s been your favorite team building event? My favorite event so far has been our a fondue making class at the Cheese School in the Mission. 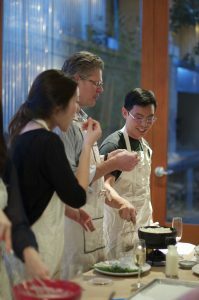 We all made different types of fondue – and my team made the goat cheese fondue with fresh herbs and horseradish. It was so delicious. What are you most excited about in the next year? Helping us grow the product team. 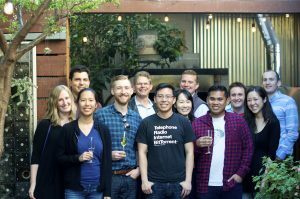 We’re doubling our team this year so I’m excited to meet and work with new engineers. What should people know about NovoEd? We love to play foosball! What do you love most about working at NovoEd? I love working in downtown San Francisco. We’re also a great team who is passionate about education.